STABILITA' RISOLUZIONE IMMAGINE EFFETTIVA REPLAY DELLE PROGRAMMAZIONI SETTIMANALI FLUIDITA'DEGLI EVENTI SPORTIVI ECCEZIONALE.... SERVIZIO TOP UNICAMENTE PER VOI AMANTI DELLO SPORT CHE POTRETE GODERE DEGLI EVENTI DA PIU PROSPERTIVE CON TELECAMERA ON BOARD. CIAO STAI CERCANDO UN SERVER CHE NON ABBIA FREEZ CHE SIA STABILE E CHE ABBIA UN OTTIMA FLUIDITA'? PIU DI 80000 CANALI SCELTI PER TE SUDDIVISI IN TUTTE LE CATEGORIE, DEVI SOLO SCEGLIERE IL PROGRAMMA CHE PIU TI PIACE. 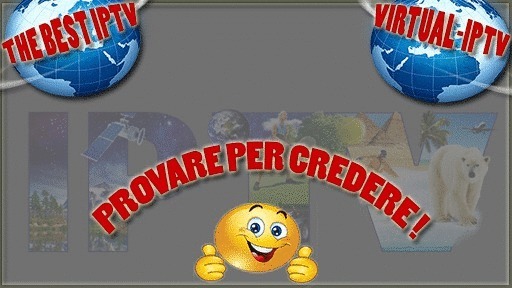 ABBIAMO PENSATO PER TE A TUTTI I FHD HD ED SD PER CHI GODE DI CONNESSIONE LENTA, ABBIAMO CANALI CON PROGRAMMAZIONE RITARDATA FINO A SEI ORE, E PER I PIU ESIGENTI UNA SEZIONE DEDICATA AI REPLAY MENSILI, OLTRE A TROVARE CANALI SATELLITARI, 4K,3D,BLUE REY, CONCERTI, TUTTI GLI SPORT MONDIALI E OVVIAMENTE LE PIATTAFORME ATTUALI PPV.